Does the Moon trigger interglacials? Why did the last 8 glacial periods only end when the earth’s orbit around the sun reached maximum eccentricity ? This is the real unsolved mystery of the Ice Ages as discussed in previous posts and recently on scienceofdoom. With the last of these posts I finally thought there could be a solution to this mystery based on resonant interplanetary dust, but alas I could find no evidence whatsoever in TSI data and dismissed the idea. However I now realise that perhaps there is another solution which may have been looking us in the face all the time. The Earth already has a large resonant interplanetary body – the moon. There is no need to invent some hypothetical resonant dust. The trigger for interglacials is not changes in insolation but instead changes in tidal forces acting on the oceans and cryosphere. 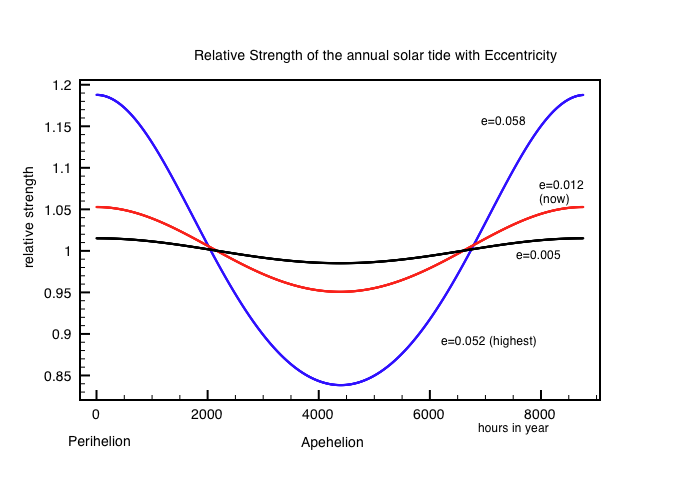 Every 100,000 years super-tides must occur whenever the decreased perihelion distance of the earth from the sun and the moon coincide and are synchronised with maximum eccentricity. These tidal forces combined with already known increases in insolation could well be the trigger that initiates the rapid break up and melting of the northern glaciers. The 100,000 and 400,000 year cycles in the ellipticity of the Earth’s orbit are caused by regular gravitational effects of the other planets as they orbit the sun, particularly those of Jupiter and Saturn. Every 100,000 years the orbits of Jupiter and Saturn align themselves so that their net gravity perturbs the Earth’s orbit causing it to elongate and become more elliptical. This cycle reaches a maximum every 400,000 years in regular fashion. The moon also is effected by the same regular (Milankovitz) induced variation in its orbit around the sun. This also causes an increased elliptical orbit of the moon around the Earth. Tidal forces vary as 1/r^3 so small changes in distance can have large effects on tides. The gravitational force of the sun on the moon is more than twice that of the Earth. For an observer in outer space the moon appears to orbit the sun just like any other planet. It’s orbit is perturbed by the Earth’s gravity making it slightly concave. It is only from Earth that it appears to us to be in an elliptical orbit around the Earth. Therefore the moon like any other planet is just as effected by the gravitational effects of all the other planets . It’s orbit becomes more elliptical both with respect to the sun AND respect to to Earth. Spring tides occur when the sun and moon are aligned – new moon and full moon. When this alignment occurs at perihelion ( currently around Jan 2nd) the tides are far stronger. This is the main reason why UK storms this last week caused so much damage because they also coincided with a super-tide at perihelion and new moon. 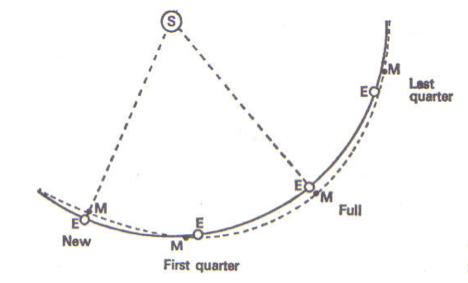 The precession of the lunar orbit plane takes 18.6 years and changes the declination angle by ± 5 deg. Once every 2000 years the projection to the ecliptic of the major axis of the lunar orbit coincides with the Earth-Sun line at the perihelion increasing tidal forces by a further 12%. Fig 2: orbital-plane of the moon with respect to the ecliptic plane. Now we consider the 100,000 year effect of a peak in the eccentricity and its effect on tides. Tidal mixing within the water column and at the base of the sea ice cover can increase the heat flow from deeper water masses towards the surface causing decreased freezing and increased melting of sea ice and possibly the formation of sensible heat polynyas (Morales-Maqueda et al., 2004; Willmott et al., 2007; Lenn et al., 2010). The tidal currents can additionally increase the stress and strain on the sea ice and cause leads to open periodically within the sea ice cover (Kowalik and Proshutinsky, 1994). Tidal forces therefore act to break up ice sheets and change ocean heat flows. Spring tides occur when the moon and sun align together at new moon and full moon. The largest spring tides are when the Earth is at closest distance to both the sun and the moon. The Milankovitch precession term also depends strongly on the eccentricity, so when every 26,000 years perihelion coincides with the northern summer so the arctic also receives maximum insolation. In addition once a month in summer the arctic experience super tidal forces leading to the breaking up of ice and enhanced heat mixing. The combination of the two effects starts the retreat of the ice sheets and the positive feedback of lower albedo accelerates melting. Is this the real driver that forces the onset of an interglacial ? The largest solar tides are up to 20% higher than those we experience today. Now lets look at the same thing for the more important lunar tide. 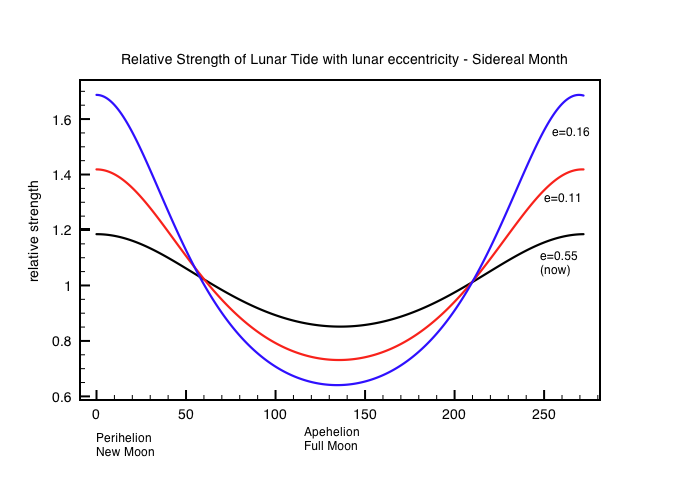 Fig 5: Variation in strength of lunar tides with orbital eccentricity relative to today. Now we see that spring lunar tides can be up to 60% higher than they are today. Lunar tides are currently about twice the strength of solar tides so we can estimate how much stronger spring tides could have been 15000 years ago. It seems very likely that spring tides were at least 50% stronger than they are today. Is this why interglacial melting can only start when the earth is at maximum eccentricity because only then are the tidal forces strong enough to break up the ice sheets ? For 800,000 years glacial periods have ended abruptly once the orbit of the earth reaches a maximum orbital eccentricity. Milankovitch insolation theory cannot explain this 100,000 year cycle. The lunar and solar tides on earth are also affected by the same Milankovitch cycles. Their effect on ocean heat transfer and ice formation has been long documented. Maximum spring tides existing 15,000 years ago were likely at least 50% stronger than those today. This must have had the largest effect in polar regions and is directly linked to the 100,000 year eccentricity cycle. It therefore seems feasible that the moon really is responsible for the regular glacial cycle. Note: A recent discussion on Ice Ages can be found on Euan Mearns blog. There is a also a series of posts on scienceofdoom which review how climate models struggle to explain the dynamics of ice ages. The most recent of these posts is very relevant. This entry was posted in Climate Change, Ice Ages, Oceans, Paleoclimatology, Science and tagged Climate Change, Ice Ages, Moon, Tides. Bookmark the permalink. 54 Responses to Does the Moon trigger interglacials? This is an intriguing hypothesis that I don’t remember having come across before. I’ll need to think about some more to see whether I have any specific comments. In the meantime I’ve posted a link to the article over at Tallbloke’s Talkshop. It is always about energy transfer, energy accumulation (or loss) in the atmosphere, biosphere and very, very shallow lithosphere. Any calculation possible on what the energy difference would be? Legends, please. It may be transparently obvious to you what the coloured lines represent, but to the Rest Of Us, not so much. Sorry for so many typos ! mostly fixed now I hope. you’re close to having a slam-dunk here. Well done! Most sensible interglacial hypothesis I’ve seen yet. I see you’ve tossed your hat in on the SOD site, too. The whole linked article seems to assume that insolation variance is the key, and they somehow just have to get the sequence down right. I’ve come from the Talkshop after seeing Roger’s link. What you say works for me. I’ve always wondered how the small insolation variation in the Milankovitch cycle could trigger ice sheet collapse. I agree that (quite apart from the thermal tidal mixing) the mechanical upheaval could accelerate melting. I reckon this would happen in several ways. 1) Firstly by flexion of multi-year fast ice at the continental join especially in Antarctica. It is documented that tsunamis only a few feet high can calve ice bergs (but this point is re fast sea ice; bergs/shelves are in point 2!) Those tsunami events are isolated but mega tides running along the coast, under the ice every 12 hours for months would be quite destabilising to say the least, breaking it free to be at the mercy of the winds. It would have the effect of eroding the winter sea ice area year on year and consequently the summer ice extent too. 2) if the same effect as above is applied to ice shelves, they would be continually decoupled from their glaciers at a greater rate. That would accelerate glacial flow and more calving by the tides. 3) Greater flexion of the glaciers further inland could cause more melting within and at their bases. It has long been thought that more meltwater at the base of glaciers induces faster flow to the sea, possibly even a runaway flow scenario. I think the effect point 3 would be only very small over and above what already happens. But coupled with points 1 and 2 and operating over decades/centuries it could just be the trigger. The key is in the time frame: a slightly higher load on the ice, applied relentlessly for centuries. If this is right, there could be a tidal value of say 25% or 30% above today’s tides that would trigger ice cap collapse over 2000 years. Yes and once glaciers begin retreating the reduction in albedo enables the small insolation increase to then accelerate melting trough positive feedback. Increasing CO2 outgassing also helps a bit. Any tidal effects act at both polar regions simultaneously, whereas Milankovitch induced insolation changes are asymmetric. When there is more insolation inside the northern arctic circle in summer months, then there is less insolation inside the antarctic circle. Ice core records show that both poles warmed more or less at the same time. Increased tides could have been the trigger that allowed higher insolation to start melting the northern ice sheets first. I am not an expert on glacier dynamics. No not really. I am following the long run of posts on SoD which is reaching the same conclusion – that climate models as they stand cannot explain glaciation cycles. Although SoD has a tendency to be a little bit arrogant and dismissive of alternative views he does also have some interesting posts and very smart participants. Cuedos for proposing this interesting hypothesis. However, this is not a new hypothesis as it is just taking an already established hypothesis and expanding it to longer time scales. I have been promoting a similar idea (on shorter time scales) for many years, with little or no response from anyone. 1/ Motion Jovian planets –> variations in shape and tilt of lunar orbit –> long-term variations in in the influence of the lunar tides upon the Earth’s rotation, ocean and atmosphere —> long-term [inter-annual to decadal to centennial] variations in the Earth’s climate systems. 2/ Motion Jovian planets —> Sun’s Barycentric motion –> variations in rotation rate of the Sun via a spin-orbit coupling —> variations in the long-term level of solar activity –> variations in the effect on Earth’s climate systems. See: WHICH CAME FIRST THE CHICKEN OR THE EGG? It is only natural that this idea be extended to incorporate the glacial/inter-glacial cycle. Indeed if you look at the Earth’s emergence from the last Ice Age about 15,000 years ago you could be forgiven for believing that the [lunar driven] D-O events were acting like a jump starter to the Earth’s mean temperature, with the Younger Draya Cooling event about 12,000 years ago being a failed attempt to get the warming underway. 1. Are the Dansgaard-Oeschger (D-O) Warm Events driven by Lunar Tides? 3. Are Changes in the Earth’s Rotation Rate Externally Driven and Do They Affect Climate? asymmetry in its motion, so does the Earth. This raises the possibility that there might be a spin-orbit coupling mechanism operating between the Earth’s motion about the CM of the Solar System and its rotation rate. I was unaware of the great work you have been doing. Thanks for giving me a lot to think about. It is clear that there are astronomical influences on both the earth’s orbit and the moon’s orbit. Solar activity is also likely affected by Jupiter’s orbit . All these are considered insignificant effects on the earth’s climate short term. However they must have a significant effect on the long term climate on Earth. The moon anyway does have short term effects on climate. First the Earth moves 4000km closer the sun during the lunar cycle. Global temperatures change by about 0.02C per month as a result. Second moonshine is the largest source of radiant heat in the polar winter. Globally it changes temperature at night by ~ 0.01C. Thirdly the 18.6y precession of the lunar orbit moves the tidal bulge further north. Does this change the Jet Stream ? The Jet stream is high in the atmosphere where tidal effects are larger. “The D-O events are discrete events paced by a regular cycle of 1470 years.” This so nearly coincides with the 1800y lunar cycle that your analysis looks fascinating. which gives evidence that the Precession of the Lunar Line-of-Nodes and the Lunar Line-of-Apse of the lunar orbit are linked to the orbital period of the planets. Also, Chefio has done some good work on this topic too. It all seems very reasonable and plausible to me. Congratulations – you might be about to re-write the textbooks! I just wonder if the increased tidal forces you describe could also be responsible for an increase in the frequency of volcanoes. I think I read somewhere that subsea volcanoes had been found under the Antarctic ice. 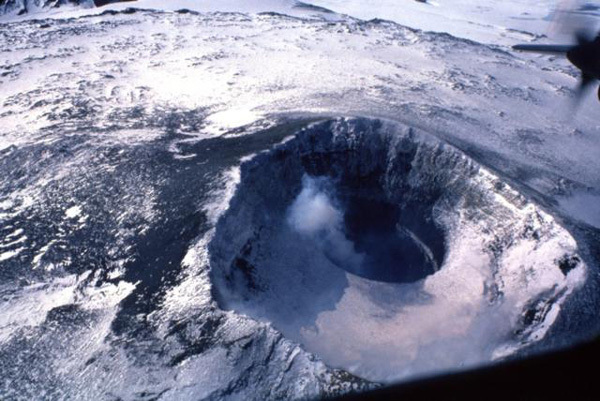 Probably a few extra subsea volcanoes would be very helpful in breaking up an ice sheet too ? I hadn’t thought of that one. There are indeed both under sea and continental volcanoes in Antarctica. There is also a theory that tidal forces on the lithosphere can trigger volcanic eruptions – but I don’t know how widely accepted that is. Here is an amazing picture of Mount Erebus near the coast of Antarctica – last eruption 2011. It demonstrates good coincidences between earthquakes and volcanoes and strong tides. It also describes a seesaw model across the Pacific, including Coriolis forces which reinforce the effects, but it is not clear to me at the moment whether the Coriolis force is in the atmosphere, the ocean, or the magma! Maybe you could help to clarify this? Anyway it seems fairly clear that very strong tides could trigger subsea volcanoes and vents which would introduce warm water under the ice. I guess in some cases a subsea volcano could even grow up to the surface and push up through the ice. That would be spectacular. My guess for the coriolis force would be that tidal flows in the ocean will get shifted westward in the northern hemisphere due to the coriolis force. The 100,000 year cycle kicked in when Antarctica became permanently glaciated ~800,000 years ago. How do we know that this is when Antarctic became permanently glaciated? Because the Epica core hit bedrock at 3,260m (~800,000 years), meaning that there was no ice in the thickest part of the Antarctic ice cap at that time, or in other words that Antarctica was substantially ice-free. Since then, however, ice has always been present. I didn’t know that Epica hit bedrock at 800,000y down. That really is interesting. So yes the circumstantial evidence is that only after Antarctica became glaciated did the 100,000 y eccentricity cycle begin. Before that the cycle was that of a regular 41,000 obliquity term. There is another mystery – which is why the earth entered a slow cooling trend 5.3m years ago. Was it due to the closing of the panama isthmus separating the Atlantic from the Pacific ? The hole was actually stopped 5m above bedrock to avoid penetrating the melt layer, but I guess that’s close enough. This is causing me to re-evaluate my theory that glacials and interglacials are driven by ice advances and HE retreats in the North Hemisphere. Maybe they’re driven by the advances and retreats of SH sea ice that couple preferentially with the 100,000 year orbital cycle and the NH just follows along. Yet geoligists tell us that Antarctica was first glaciated at least 10m years ago. It used to have a temperate climate 30m years ago when it was connected to S. America. The Circumpolar Antarctic current now isolates Antarctica from warmer ocean currents. So where now is the ice from 10 million years ago ? According to Ólafur Ingólfsson (Quaternary glacial and climate history of Antarctica, Quaternary Glaciations – Extent and Chronology, Part III) “The Antarctic ice sheet has existed for about 35-40 million years”. Another interesting tidbit I came across was this reconstruction of sea levels through geologic time using seismic records from continental shelf environments. It’s difficult to see where an ice sheet developing in Antarctica 35-40 million years ago figures in. None of this of course proves that there was no ice in Antarctica before ~800,000 years BP, but I think the possibility has to be considered. Certainly the concept of an Antarctic ice sheet that’s been in place for millions of years needs to be reviewed. Clive thanks for taking the time to look at some of my work. and look at the top right hand side of the first figure, you will see that DO events 3, 2, 1, and 0 all occur at times that mark the start of significant warming periods in the last 16,000 years. DO event 3 is at the start of the first warming event. Following this event, the World’s mean temperature starts the long climb towards modern day temperatures. DO event 2 marks the start of a sharp warming trend that almost get the world’s mean temperature up to modern day values. Temperatures peak about 14,500 years BP and then drop until about 12,500 years BP. DO1 interrupts that fall near 13,000 BP with a short weak increase in temperature before the world descends into the full force of the Younger Drayas. Then finally, DO event 0 lifts the World mean temperature to its modern Holocene values. If you look back through the Ice age between 20000 and 50000 BP you can see many (but not all) of the DO events producing temporary increases in the World’s mean temperature. This would indicate the the lunar driven DO events act like an ignition source but some other factor (e.g. changes in the eccentricity of the Earth’s orbit producing peaks in the strengths of the the largest lunar tides) is needed to allow these ignition events to take hold and lift the mean temperatures up to modern inter-glacial levels. – In addition there is a 5000 year modulation in the strength of SPET as well. – Ice busting monster tides occur every 100,000 years when a SPET occurs with the earth’s orbit at maximum eccentricity. Then both the distance from the earth to the sun and earth to moon at perigee is at a minimum. Their paper proposes that these cycles coincided with cool spells caused by increased mixing of deep ocean wit surface water. The most recent of these was the little ice age. They propose that some(most) of the observed warming is due to the recovery from this cold spell. The next cold cycle is due in the 35th century. You are now proposing that it is the synchronization of these super tides with the season that matters. 1st January coincides with perigee for the earth-sun. “The strongest alignment between the phases of the Moon and the 177.0 year Perigee-Perihelion cycle occurs at the FULL MOON at 739.001 years.” Or 1478 years between 2 new moons. Is this correct. You are saying these events trigger D-O climate warming events during the last ice age. Is this correct? I haven’t yet convinced myself of the logic for 1478y but will look more into it. That should have been the top right of the second diagram. Clive is this widely accepted? Do you have any graphics to illustrate the point and how the positions of Jupiter and Saturn have evolved over the past 20,000 years and the next 20,000 year? Does this not have to have an impact on The Sun? I often wonder if our view of The Sun is anomalous – perhaps sunspots only appear with this orbital / gravitational alignment. Perhaps the solar wind is normally much weaker? I am only repeating what I have read the Jupier and Suaturn graviational effects are the cause of the change in eccentricty of the earth’s orbit. I have downloaded the JPL ephemeris which NASA use for all their space missions. If I find the time I will quantify this effect and also see how the moon’s orbit varies. Indeed Jupiter orbits the sun every 11.8 years and has a larger eccentric orbit than earth. It has 320 times the mass of earth and has the largest gravitational pull on the sun. It would be surprising if Jupiter did not effect solar activity. Euan and Clive: If you go over to Tallbloke’s Talkshop and search for “Jupiter” you will find all kinds of posts on this, several of them written by Ian. The idea that orbital machinations drive the interglacials requires one of two things. Either the energy involved is very high, so that a stable glacial system is pushed into an unstable, interglacial state – which implies that the glacial state is the “preferred” state – or that the Earth is at a tipping point prior to this event – in which case a small push triggers a large response. The interglacial state must also have some positive feedback that maintains the state, as the time of orbital influence is less than that of the interglacial. However, if there is a threshold, tipping point, then a slow decline back to a glacial period might work, as the difference between a glacial and an interglacial energy-wise on the planet would be small. We do have some idea of what it takes between hot and cold periods/glacial advances and retreats, from pure TSI models/comparisons/correlations. Again, do the orbital harmonies give us that power (not just energy)? I am not disputing the theory. Just pointing out the implications. My thinking is the following. 1) 5 million years ago a gradual cooling of the climate began. This was most likely due to plate tectonics. First Antarctica moved further south to sit over the south pole isolating the southern ocean. Second the panama isthmus closed cutting off circulation between the Atlantic and Pacific. 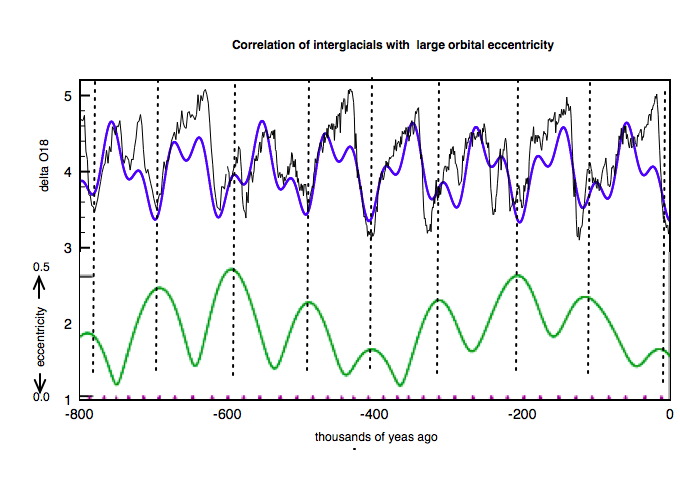 2) A regular glacial cycle began driven by the 41,000 year change in obliquity. Higher obliquity brings higher insolation to both poles modulated by precession of equinoxes. The 41,000y signal dominates glaciation cycles from 5 million years ago until 1 million years ago. Meanwhile the intensity of glacial periods was increasing with the global cooling due to plate tectonics. 3) 900,000 years ago this general cooling amplified further the ice sheets in the northern hemisphere so that they were unable to melt back during the next increase in obliquity. The cycle of 41,000y ice ages was broken. 4) Something else was now needed to trigger ice ages and that was extreme tidal forces caused by maximum eccentricity. When these coincided with peak insolation in the Arctic circle the breakup of the northern ice sheets could begin and they collapse rapidly within one precession cycle. I have just calculated the effect of the closer distance of the earth to the sun at perigee for a maximum eccentricity – the tides are 15% larger. I have searched everywhere for calculations of the change in eccentricity of the moon-earth orbit caused by the same gravitational resonance (Jupiter and Saturn) that effects the earth. I can find nothing. If the eccentricity changes by the same proportion as that of the earth’s orbit round the sun then we have tides at least 50% stronger than current perigee spring tides. These can surely crack and breakup large ice sheets. Sea bed cores from the W. Antarctic show three intense ice-rafting events over the last 3 million years that are “consistent with rapid disintegration of ice streams and release of icebergs from the continental shelf”. They occurred about 1 million years apart at 2.8, 1.9 and 0.88 million years BP. The coincidence of the 0.88 million year event and the absence of ice older than 0.8 million years in the EPICA core suggests to me that these rafting events reflect periodic breakups of the Antarctic ice sheet, in which case we are looking at a ~1 million year interglacial cycle in the Antarctic, with the next interglacial due about 100,000 years from now. The report also notes a transition from 41,000 to 100,000 year cyclicity 1.01 million years ago. 0.88 Mya corresponds to the switch from 41,000 y glacial cycle to 100,000 y cycle. 2.8Mya is round about when the Panama isthmus closed circulation between the Atlantic and Pacific – Gulf stream starts. This may or may not have any relevance. What I would really like to find are references to any long term calculations of the moon’s orbit round the earth. I am convinced that Milankovitch effects must exist in the lunar eccentricity. I can find no reference to it anywhere. If I assume that the proportional change in eccentricity is the same as that for the earth orbiting the sun then we have a giant tide effect coincident with the 100,000y cycle. I’ve been tossing the idea around for a while of trying to construct a model explaining the glaciation cycles, via a somewhat obscure mechanism that takes advantage of the heterogeneous nature of the changes in solar insolation due to Milankovitch cycles. One of the problems I’ve been running into is finding data I really want, and finding the right method for working with it. 1 & 3 amount to large changes in albedo, but are unevenly distributed, further triggering 2. This, if combined with a tropical thermostatic control mechanism/negative feedback, leads to glacial interglacial cycles governed by orbital changes that are dominated by *large* changes in high latitude temperatures and *small* changes in tropical temperatures. Indeed, the tropical temperatures could even end up being out of phase with the global changes, at least in some places. CLIMAP appears to bear this out: it shows parts of the tropical Pacific *warmer* than the present during the last glacial maximum. It is also worth noting that the above could account for geographic factors, too, if changing land distribution alters the monsoon patterns. Anyway, I find your work on this subject interesting and I wonder what you make of this suggestion of mine? I agree that changes in the ocean heat flux from the tropics to the poles in winter must play a role in initiating and prolonging glaciations. So yes if the MOC heat engine gets interrupted for some reason then the polar regions will get colder and the tropics might get warmer. This is the other great mystery. Why does the earth slowly cool down and enter another ice age after an interglacial ? Perhaps the natural climate of the earth is that of an ice age and interglacials are the exception. My proposal is that extreme tides caused by a shift in the earth’s and lunar orbits kick starts the ocean circulation again pulling the earth out of a glaciation. Partly I’d say that if you put a positive carbon cycle feedback out of phase, it will actually act as an inhibitor to change when things switch directions-that is, because it may take a thousand years plus for CO2 and methane to start to decline after temperatures start to, they end up remaining elevated and making things slightly warmer than they would otherwise be. However, this can’t really account for the full difference between the rapid warm ups and slow cool downs. My guess is that it is mostly an asymmetry in the ice albedo effect. The strength of the ice albedo feedback would actually be different for different climates, and it would also be different depending on the direction of temperature change. For example, it is generally stronger on a colder world, since the ice is at lower latitudes. If the ice albedo feedback is strong during a glaciation then it will accelerate warm ups out of such conditions, but if it is weak, as it probably is in the current climate and interglacials in general and event weaker in still warmer climates, then it won’t accelerate the cooling out of those conditions. I have always found it odd why people cite the most “obvious” climate feedback as being from water vapor. That water vapor should amplify temperature changes, is not nearly as “obvious” as that ice should. I guess it’s because there isn’t enough ice for it to be important, at least form future warming. Great article and research. Excellent follow on discussion. Unfortunately by the time I even start to comprehend this, we’ll be frozen. To quote Sever, “shame on the moon “. But I guess you will keep looking after “anything but CO2” – which kind of defines your position very well. Thanks for this, it is very interesting and useful information. Can you give a precise reference for these very precise calculation methods ? Can you confirm that they can be used to get very precise and reliable results going back e.g. 800,000 years ? What are you talking about ? The Jovian planets have nothing to do with it. They have no “tidal” effect on the earth. The earth’s moon however does and any changes in the earth’s eccentricity will also affect the moon. I suggest you read through the series of posts at scienceofdoom. http://scienceofdoom.com/2014/01/30/ghosts-of-climates-past-fourteen-concepts-hd-data/ where he reviews many recent (peer reviewed) papers on the models of glacial cycles. CO2 is certainly not a cause of ice ages – it is more a symptom of ice ages which may contribute indirectly in both the warming and cooling cycles. Is agreat little book on the history of the researchers into the ice ages, that also gives a good introduction to the theory. One bit was particularly interesting. It is not closest approach to sun when things melt. It is north pole tilted toward sun at greatest distance. Summer is a few days longer then, so much more melt time. Don’t know how that interacts with tides. But take a look at length of seasons at apogee vs perigee vs tilt. When Watts/m x m goes over a limit AND long summers by a few days, then melt starts. There is some hysteresis, but we are now just a few Watts from unrecoverable freezing. We are in a metastable Watts range and any cold drop may become latched up in frozen. The tides and ice breakup is interesting. It would be nice to see that mapped onto the historical timeline. It could help explain some of the rapid trigger points. I’ve been thinking about that slow descent into a glacial. Another factor that relates to tides is http://en.wikipedia.org/wiki/Post-glacial_rebound . The http://en.wikipedia.org/wiki/Canadian_Arctic_Archipelago is slowly rising and the amount of heat that can be moved there from tides and ocean currents is waning. Surely we are headed for the tipping point. Thanks for the link. Hello again. It occurred to me that another effect of increased tidal forces on the planet. Plate tectonic theory says that our crust is, like the arctic ice cover, a ‘frozen’ sheet over a ‘liquid’. So, during periods of increased tidal forces, wouldn’t it stand to reason that plate boundaries, subjected to higher tidal forces, would move more, and volcanic and earthquake activity might be higher? I know that generally this kind of activity (volcanic) typically releases crap into the atmosphere that would have a cooling effect. Even so, are there archeological records that might show any correlation? So you might expect the same forces to acting on ice sheets to aid calving of the ice, especially when coincident with increased solar radiation. There is no contradiction between the age of the ice at the bottom of a core being only 800,000 years and glaciation existing for ten million years at the same place. Ice under pressure flows. That limits the age of the ice at the bed rock interface to much shorter time than ice has been present. The absence of ice older than 800,000 years in the EPICA core is also compatible with there having been no ice there 800,000 years ago. The long term cooling (55MYA) of the earth’s atmosphere is almost certainly due to Loss of atmosphere. This might explain why our preceding ice ages and interglacials are getting more severe. I believe some of the atmospheric warming is due to mankind also adding to the gas mass. I calculated -200′ QNH. Please, I’m open for correction and considerations here. Just some non scientific stupid thoughts. If the moon can be an influence…. The galaxy rotates to right. Horizontally but on its axis to ? We rotatate spinnig inside the galaxy with the galaxy. To be kept together there must be enough gravitational mass. What if that is not a constant but it whobbles to.. And then there is the kuiper belt.. It changes and is not equally dense, planets pull on it something crashed trough it. What if we are hit by ice meteors and not by iron meteors.. Is the ice dating precise enough ? Maybe poles can grow faster than we think and maybe not always at the same spot..
Viscosity of earths inner. And rotation and whobblwe of its outer. Why do we whobble. Outer and inner core seem not to rotate in equal speed. Suppose it would cool off a bit. Then like a boiled egg it would defenitly spin better. An egg in space has a fixed crust so its inertia will not change and still it spins different but earth with water and a flexible crust will.. So if oceans / water are more and grow things will be become more and longer warmed what will be its effect. I suppose earths stabil normal form would be warm not cold. So we must ask our selfs not what warms it. But what makes it cold.. And what caused the whobble..